Delicious! I do not precook the asparagus- it would be mush! I’ve been making this for a few years. Love it. I substitute broccoli for asparagus, reduced cheddar for the Swiss and onion for the shallot. I bring the leftovers to work for lunch the following day. I’m thinking the point value and calories should be similar. This is something I would love to take for lunch, any tips for reheating? You can reheat either in the oven at 350 or in the microwave. I made this last night and it was wonderful! Definitely easy enough for a weeknight meal. 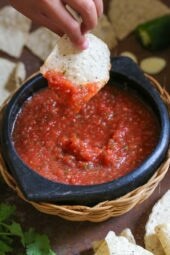 Tasty enough that my hubby loves it too! Thanks! 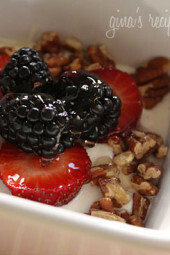 This sounds like a wonderful dish for our Father's Day brunch! My dad loves quiche, omelettes, and anything with eggs, but he's supposed to be watching his cholesterol intake. With your flavorful lightened version, it sounds like he wouldn't miss the full-fat original at all! Does anyone know what the amount of eggs I would need if I wanted to use egg beaters instead of the egg/egg white combo? Do you have any suggestions for storing asparagus so that it doesn't go bad so quickly? I buy mine on Sunday and by Wednesday it's getting slimy. so it is upright with a little amount of water to keep fresh. This works for me. 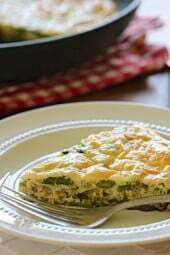 Gina, I love using egg substitute for these types of dishes. Lowers fat, calories & cholesterol. I love how simple and fresh this looks (and, tastes, I'm sure). So perfect for this time of year! Yum! 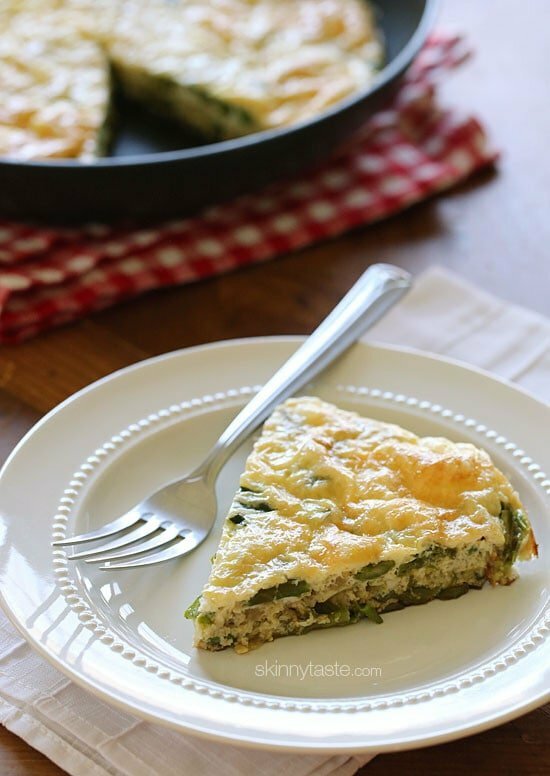 My favorite way to eat asparagus is to just quickly pan fry it with a little butter and some bacon, just because that's what my mom did every spring 🙂 The frittata looks delicious!! Hey Gina, I LOVE your site even though I don't officially use weight watchers. I am loving the healthy versions of favorite meals and am making this for dinner tonight but adding turkey bacon at the request of my 12 year son. Also, It's just my son and I now after big split last year so I recently got asparagus and have plenty left over. 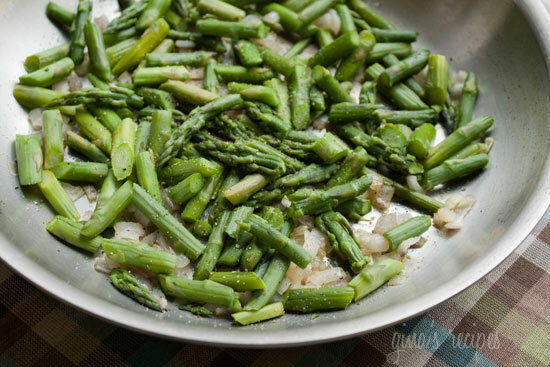 I am using some of the leftovers in this dish but I would love to know all the ways you use up a whole bunch of asparagus. Please answer even though I know you posted this a few years ago. LOVE your site! I usually add them to salad, or just eat it chilled with a balsamic vinaigrette. 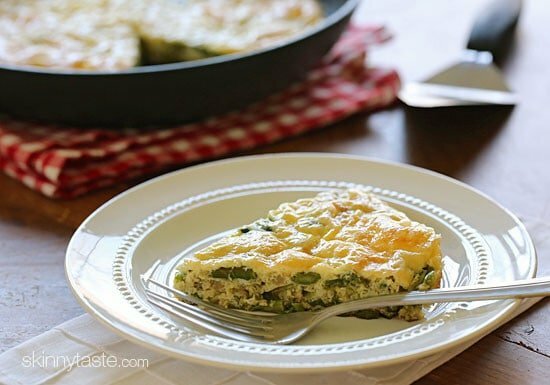 Try making Asparagus lasagna… We love it! 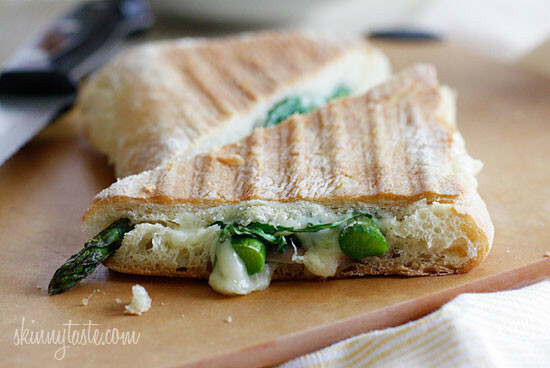 I just finished having this for lunch (to make a single serving, I just used 1 egg and 1 egg white), and it was AMAZING! I had leftover grilled asparagus in the fridge, so it came together FAST. Thanks so much for sharing all your wonderful recipes! According to WW this equals 6 PP not 4. Dish still looks AMAZING and excited to try. Are the points for the whole dish or per serving? Could I bake this and then freeze it? I don't see why you couldn't! Can you find Pecorino Romano in any grocery store? Or what other cheese can you use? Yes, it's usually available in the fine cheese section. Parmesan cheese would work in it's place. I just made this. AMAZING! Another great one! You have me on a roll and no one can believe this is healthified cooking. I've spread the word to EVERYONE I know and even those I dont know (so much). Thank you, thank you, thank you! I'm not a fan of Swiss cheese. What other kind of cheese would you suggest in its place? Hi Gina, I am going to make this frittata tonight for dinner and I put the numbers in my point calculator and it came out as 6 pts+ per serving instead of 4. Did I miscalculate? I'm still going to make it either way! Sounds delicious! How many points? 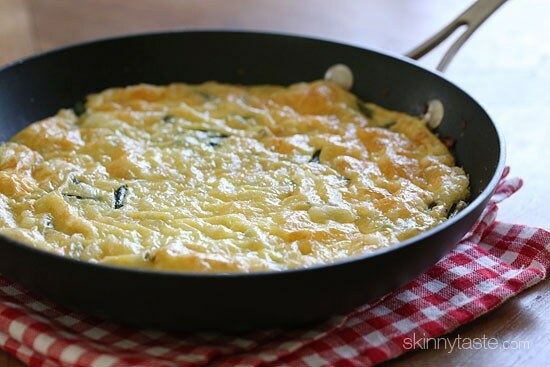 I made a bacon, potato & swiss frittata using your recipe as a base. I just omitted the asparagus, and instead added 3 rounds of breakfast style thick cut canadian bacon (1 point) diced and cooked baby red potatoes (1 point per potato), also diced, and then make it according to your directions, and it is really yummy! 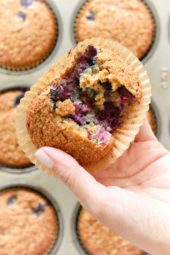 Thank for the delicious recipe! Awesome that your kids like veggies!! Mind? Please do! Spread the word and thank you!! Loved this one, it is a keeper. Hope you don’t mind, I’m giving your blog out to many of my friends and family. I just love your blog way too much.